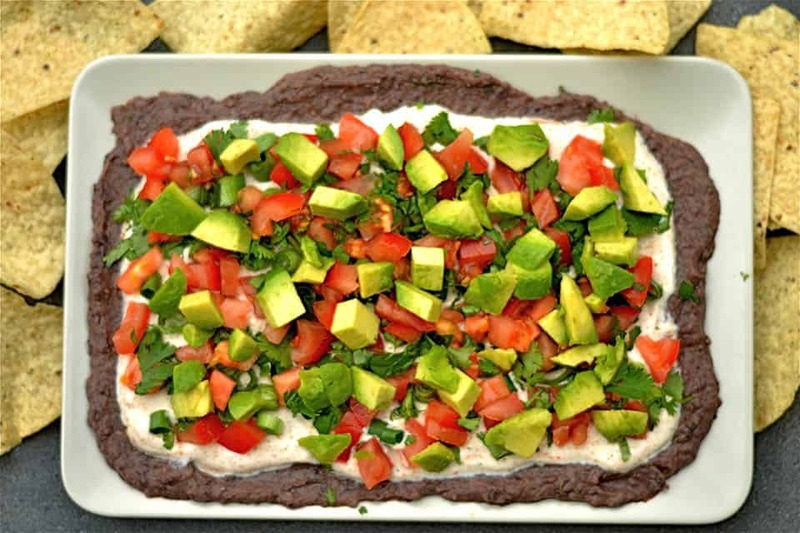 Chipotle Black Bean Hummus layered dip is a twist on the classic 7-layer Mexican dip. 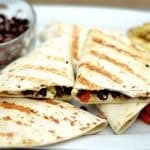 It starts with a blend of chipotle pepper spice & black bean hummus, greek yogurt blended with spices, and finished off with traditional Mexican garnishes. Serve with chips, pita bread, or vegetables for a healthy snack or appetizer! 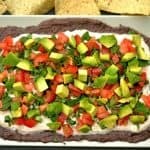 7-Layer bean dip was a childhood favorite of mine. 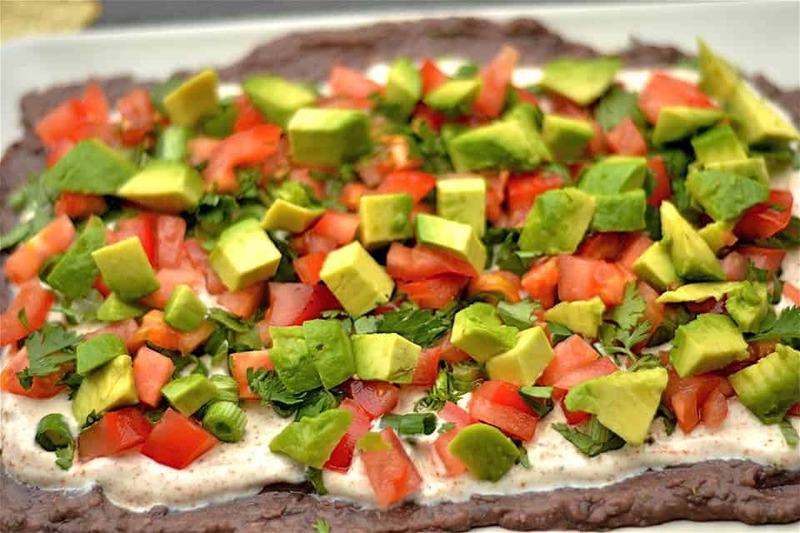 You know the one with refried beans, tomatoes, sour cream, cheese, onions, avocado and cilantro? 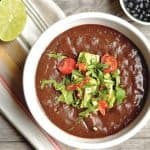 I’ve re-created it here by combining the smoky taste of chipotle spice and blending it with black beans. 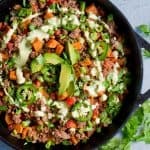 I also love this version because I omit the cheese, and use greek yogurt in place of sour cream providing some extra protein. 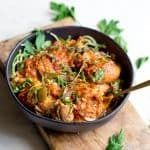 My girlfriends and I were getting together once a week to watch the Iowa Farmer season of the Bachelor, and this was one of the dishes I brought to add to our soiree. IT was a huge hit! It makes a fabulous summer appetizer because it stays cold, and honestly, who doesn’t love a delicious dip with a bit of spice?! 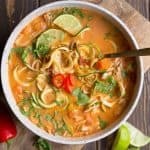 It all comes together nicely in less than 10 minutes and can also be made ahead up to 8 hours (just be sure to add the avocado right before you serve). For the hummus layer: Begin by draining and rinsing your black beans. Set inside a food processor or blender. 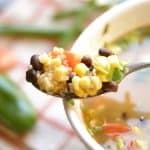 Add 1/2 cup chopped cilantro, 2 tbsp lime juice, 1/2 tsp chipotle powder, 1/2 tsp cumin, olive oil, minced garlic, water, and 1/4 tsp salt. Blend until beans are nice and smooth. You may need to add a bit more water if mixture is too thick. Spread hummus layer across the bottom of a serving plate or dish. For the Greek Yogurt layer: Mix together yogurt, 1/2 tsp cumin, 1/2 tsp chipotle powder, ground coriander, and 1 tbsp lime juice. Spread on top of the hummus layer. Add chopped fresh tomatoes, then onions, then cilantro. Finish the dip off with avocado. 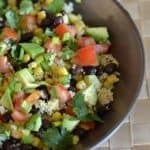 Can be made ahead up to 8 hours, but wait to add avocado until right before serving.